Tour the world in eight photos, courtesy of the photographers of WordPress.com. Speaking of untold stories, the following moment of domesticity in the middle distance at Plebs Street Photography caught our eye. 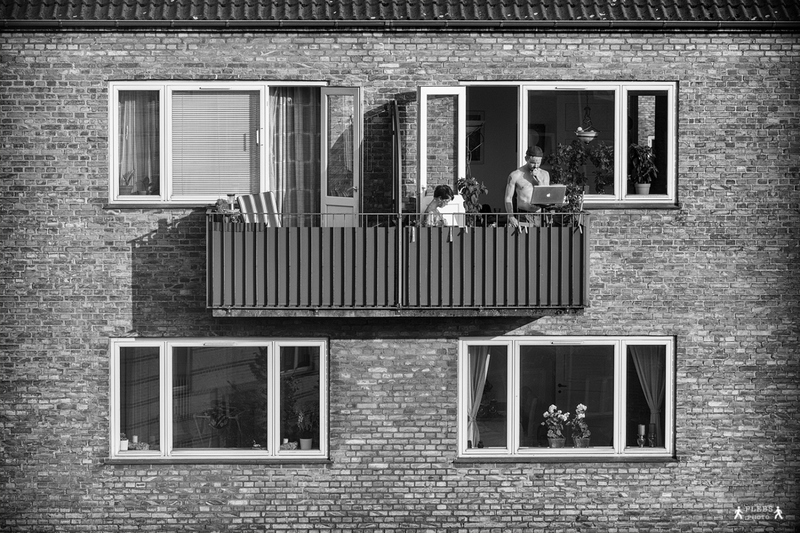 A woman, and a man working on a laptop, are both enjoying a bit of stolen warmth during Copenhagen Indian Summer. What is she doing? What is he working on? We love the way this photo allows us to imagine their story. 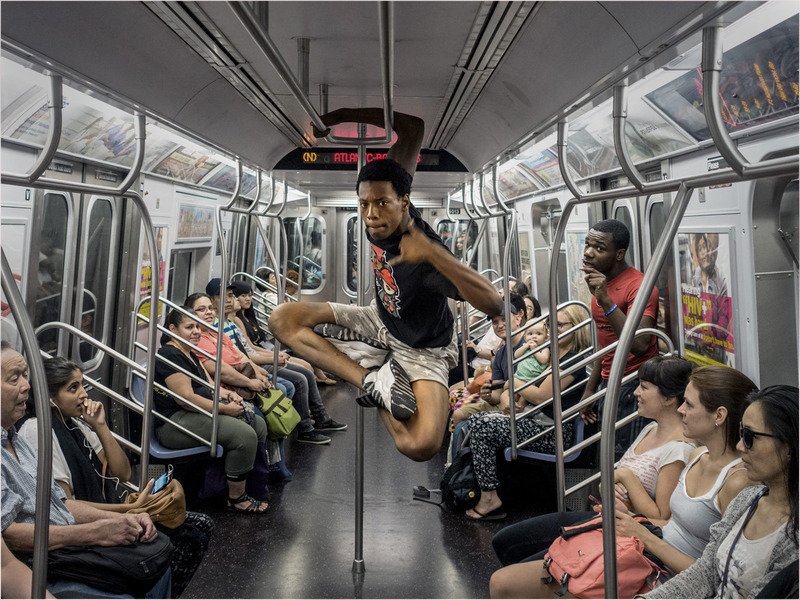 Matt Weber, a photographer who has documented New York City’s fleeting moments for the last 25 years, captured this subway performer’s serious glare and the polarizing effect this “subterranean gymnast” had on the passengers around him. If you were on this train car, would you be appreciative or apathetic? Another quick spin through the WordPress.com Reader takes us from New York City’s subway to the following quiet moment in Venice, Italy, courtesy of photographer Kyra Betteridge. Kyra captured these gondola drivers in repose, as they waited for their next customers. We love how the light in this photograph draws your eye directly to the drivers, in their bright, striped shirts. Check out more of Kyra’s work on her site, Kyra Betteridge Photography . At Life is a Vacation , Sangeeta wrestles with her emotions over the following photograph she took in Mandu, India, post-monsoon. The elderly woman struggling up the muddy, slippery incline reminded Sangeeta of her own nonagenarian grandmother. Jessica Heckinger Nowak captures a different sort of solitude in this image of an accordion player in the streets of Paris, France. We love how if you focus your gaze on the player, the graffiti scribbled across the low wall resembles the flurry of musical notes we imagine emanating from his accordion. Interested in seeing more? Check out Jessica’s work at National Geographic . Finally, we couldn’t resist these two cats in full relaxation mode in Athens, Greece, courtesy of the the blogger behind evinaseyes . Tour the world from the comfort of your favorite comfy chair, courtesy of the photographers who share their work on WordPress.com. For more, take a spin through the street photography tag in your Reader. Enjoyed the panorama of streetscapes! The Flower seller had haggled a good price for her precious Azaleas but he didn’t begrudge her the price. He would have paid more if necessary. His feet, which had played the part of anchors attached to his legs, made heavy plodding noises on the ground as he stepped off of the grey path and onto the sodden, brown earth. “Sarah” read the headstone, a magnificent artwork carved from the boulder they had sat on as children. He placed the flowers gently against it and immediately took 3 steps back. He stood motionless for a moment longer before the tears trickled down his cheeks. “I miss you” he said to no one in particular and before he gave way under the emotional strain, he retreated back to the grey path. He wiped the tears and got into his car. Beside him was another bouquet, this one filled with Stargazer Lilly’s. His wife was waiting. Love this! Thanks for sharing your version of the story — the mystery you present is intriguing. Thank you. It was just something I felt I should write. No planning and no compression, just honesty. My favorite is the photo of the two cats on the motorcycle. Thank you for including one of my photographs here. I found your portrait of the elderly woman and the story of the photo, especially poignant. Thank you for sharing it, Sangeeta. Thank you so much for featuring belgianstreets.com in this post alongside some great photos from fellow bloggers around the world! Thanks for sharing your photography, Andy. Visiting your site was a real treat. That looks like a great site, M.R.! Thank you for the recommendation — followed! Great photos! Captured perfect moments. A big thank you for including my pic in your selection! Thank you for sharing your photography! Thanks for inspiration to create my new series of ‘photo journey’ blog posts. I found these photographers and their work inspiring too! Very cool. Thanks for sharing this group. I really like the guy on the subway – that is a great capture. I think you mean *through photos? I most certainly did! Typo fixed. Thank you, Kellie! Nice work – Thank you! I work with travel advertisements at work, and it’s nice to see something from a different perspective other than the typical promotional material. Love these photos…what a wonderful tribute. What a fantabulous post! It makes me want to explore more blogs with pictures/art/photo which I never would’ve thought. Truly a picture can speak a thousand words. Can hear the accordion player on le rue of Paris, France as he hums La Vie En Rose. Ahhhhh . . .
Amazing photography! Moments to live for. I love the images you shared and the comments, as well. So true that we are traveling the world with these blogs! I love this post because it’s a visual snapshot of lots of blogs at once and a great way to discover new blogs to follow. I loved this post because it gives me a glimpse into the world and far reaching areas where I may never get a glimpse into otherwise. How cute are the cats?? Really cool idea and great post! Thanks for sharing!! A great view of the world captured in a few intimate moments. I very much enjoyed the photos in this post because they are reality. Nothing is posed and the pictures actually show us the people of the world rather than building, landmarks and tourist attractions. Thanks for keeping it real. I found this a joy to read! I just adore the idea behind street photography. Thanks for sharing this collection of photos! This is amazing! This really opens your eyes about other cultures besides yours. So inspiring. Love the cats on the bike. Beautiful photos. Thanks for sharing these! I really enjoyed the subway performer, having been to NYC you never know what your day may hold as you go into the subway, AWESOME PIC!! Nice photos…especially the young boy reading and the subway performer. great photos! just been in paris and saw the same accordeon player on that bridge..